The epigraph to Ru is the reader’s first clue that this novel embraces complexity. The reader learns that the word, in French, means a small stream, literally (and, figuratively, a flow — of tears, blood or memory). Whereas, in Vietnamese, ‘ru’ means a lullaby, drawn from what is used as a verb, meaning to lull a child to sleep. A single word possesses more than a single definition. This single word has distinctly different meanings in different languages (at a reading in Toronto, the author also referred to the English word ‘rue’ as well). Similarly, the narrator’s name differs from her mother’s name by only an accent. And in Vietnamese, the word for ‘urinate’ is differentiated from the word for ‘pepper’ only by an accent, an alteration in tone that is nearly imperceptible to the untrained ear. It might seem, at first glance, a capricious language. But, in another instance, it appears far more exacting than English. Just as the different kinds of love can be splintered from their root with precise word choice, a small stream can separate significantly, the state between sleeping and waking can be drawn with a line. A line as random and definite as the line bisecting the cover (beautifully designed by C.S. Richardson). The novel’s complexity is belied by the seeming simplicity of the structure and prose. Kim Thúy assembles her work in small segments — some only a few lines long — which could be read in a couple of hours in theory but which, in fact, requires a longer more concentrated reading spell. This is the sort of work which conjures up an image of a writer working for hours on a few sentences, painstakingly crafting each page. It embodies a kind of suffering, not only from the practitioner’s labour but from the actual experiences of the family members who have struggled to survive, travelling across the ocean to escape Vietnam. 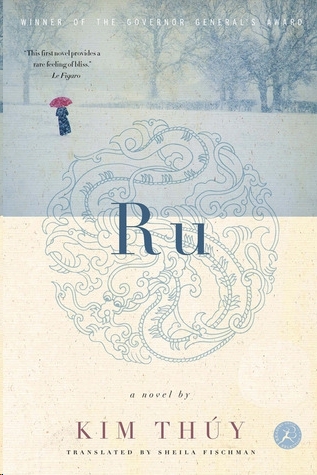 Ru is not a comfortable story, but a tale of loss, endurance and survival. If a choreographer had been underneath the plastic sheet on a rainy day or night, he would certainly have reproduced the scene: twenty-five people, short and tall, on their feet, each holding a tin can to collect the water that dripped off the roof, sometimes in torrents, sometimes drop by drop. If a musician had been there, he would have heard the orchestration of all that water striking the sides of the tins. If a filmmaker had been there, he would have captured the beauty of the silent and spontaneous complicity between wretched people. But there was only us, standing on a floor that was slowly sinking into the clay. But it is neither a choreographer nor a musician nor a filmmaker: it is a writer who depicts this experience for you. A writer who has survived: one survivor, whereas more than 400,000 others perished in their attempts to make the same voyage. This style will not suit every reader and it seems the sort which invites a polarized response. It demands patience and reflection from the reader, which is evident from a segment like this, one whole segment (what might be called, in another work, a chapter). After the old lady died, I would go every Sunday to a lotus pond in a suburb of Hanoi where there were always two or three women with bent backs and trembling hands, sitting in a small round boat, using a stick to move across the water and drop tea leaves into open lotus blossoms. They would come back the next day to collect them one by one before the petals faded, after the captive tea leaves had absorbed the scent of the pistils during the night. They told me that every one of those tea leaves preserved the soul of the short-lived flowers. The reader can imagine Kim Thúy placing each page of her manuscript into an open lotus blossom, revisiting it to determine that it has properly absorbed the experiences of a young survivor, seeking to preserve souls.